Back to basics: A new generation of artisan pickle makers are making quality cukes that stand out. Photo by Maria Shumova | IST. STEPHANIE ZONIE is a contributing editor at THE NIBBLE. CAPSULE REPORT: Pickles are good for you, low in calories and high in fiber. Pickles are flexible—a condiment on a burger or sandwich to a chicken skewer. They’re low in calories—a filling snack. 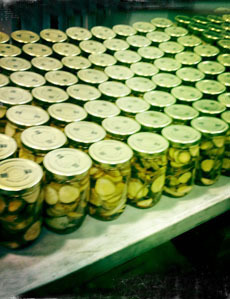 And artisan pickles make a great house gift. This is Page 1 of a seven-page article, plus six pages of reviews of artisan pickle brands. Click on the black links below to visit other pages. The United States has a pickle problem. Well, it might not be so much a problem as it is a plethora; there are significantly more than one hundred companies producing pickles in this country. That number, incidentally, includes only those businesses that pickle cucumbers; there are others who produce non-cucumber pickles, but they’ll be part of another article. Simply put, there are a startling number of pickle businesses all across this great land, literally from sea to shining sea. As is the case with ketchup, commercially-available pickles have not received much love from the American public until fairly recently. There have always been those lucky enough to find a great pickle locally or regionally, but, for most of us, pickles have been a commodity condiment: cheap, readily available, and something we didn’t spend a lot of time pondering. Even today, while most Americans are almost certainly familiar with the big national brands, like Vlasic, Claussen, and Mt. Olive, relatively few can name other brands. That situation is starting to change, though. 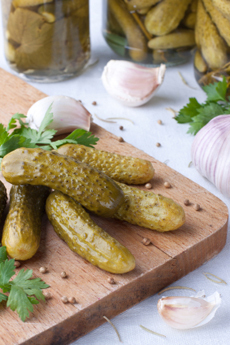 Especially within the past decade, a crop of smaller-scale (or just plain small-scale) pickle manufacturers have come onto the scene, and some have done very well for themselves. Where the big national brands sometimes use synthesized preservatives, cheap sweeteners, flavorings, and/or food coloring in their pickles, the greater percentage of smaller-scale manufacturers eschew such ingredients, preferring instead to use real herbs and spices, sugar or honey or maple syrup if the pickles are sweetened, and no preservatives or food colorings. Some of the small-scale pickle makers have products certified as non-GMO; others employ, or try to employ, seasonal and local/regional ingredients. Ready to pack—from a table, not a conveyor belt. Photo courtesy Unbound Pickling. And the creativity of the smaller-scale picklers is almost as surprising as their sheer numbers. Of course, the “little guys” make the typical varieties: bread & butter pickles, dill pickles, half-sour or sour pickles, etc. But they also put up spicy pickles (those containing one or more varieties of pepper or horseradish) or sweet and spicy pickles. And the innovation stretches far beyond that. I’ve seen Chipotle Lime Pickles, Honey Mustard Pickles, Brown Mustard Pickles, Maple Bourbon Pickles, Bloody Mary Pickles (yes, they’re in a tomato base, not a brine), Hop Pickles (that is, pickles made with hops or hop oil and beer), Blueberry Lemon Pickles, Smoky Pickles, Candied Pickles, and more. Farmers make them to sell at their produce stands or partner with local preserve companies to “put up” a surfeit of cucumbers. Pickle-lovers get sucked into the craft (Tanner’s Comestibles in Baltimore was founded in 2011 for “purely selfish reasons”, because bartender Evan Tanner couldn’t find any pickles he really liked). Those who love pickles try their best to instill that enthusiasm in others; Britt’s Pickles (www.brittsliveculturefoods.com) in Washington State sells a Pickle-ator, a Home Fermentation Kit for those who’d like to try making their own fermented pickles but might feel overwhelmed by the process. Pickles range from sweet to spicy, and everything in between. 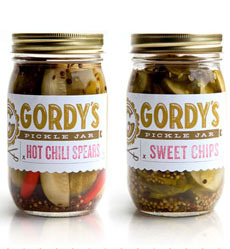 Photo courtesy Gordy’s Pickle Jar. As with most articles you see on this site, the purpose here is to get consumers to look beyond the grocery store shelves. Head to your local farmers market or produce stand or farm store and see who’s been pickling what lately. Regional festivals are a great way to find pickles new to you. Or just surf the internet to see what you can find. Vinegar-based or lacto-fermented, there’s a whole world of pickles out there, just waiting for you to discover it.